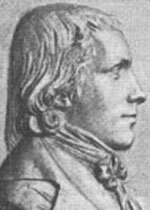 Wilhelm Heinrich Wackenroder initially studied theology and philology in Halle and Göttingen, but, with the support of his friend Ludwig Tieck, then moved to Erlangen to study law. He soon turned his attention back to literature and began working on his musical abilities. In 1794, he became an assessor at the supreme court in Berlin and, during his time in this post, also wrote literary essays which were originally published anonymously. After his early death in 1798, his friend Tieck published more of his works.